Juan Manuel Marquez STEROIDS SHOCKER: Is the LEGENDARY Boxer Juicing? Marquez appeared to have severe acne on his chest and acne is a sign of steroid abuse. The first allegations came after his victory over Manny Pacquiao where he was able to show power he had never shown in his other meetings with the PacMan, but it seemed like just sour grapes. Now, there is room for debate. 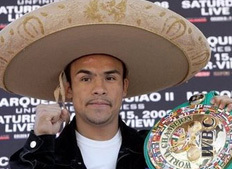 One Response to Juan Manuel Marquez STEROIDS SHOCKER: Is the LEGENDARY Boxer Juicing?